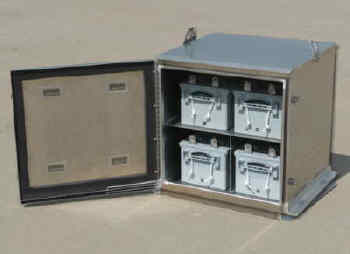 These battery enclosures are made from HDPE plastic, the same material used to manufacture the outside cases of batteries. A removable lid with handles allows easy access to the batteries for service. Enclosures for L-16s are made with a removable middle section that minimizes lifting when installing the batteries. The plastic is acid resistant and very strong, but easy to drill with a hole saw for adding conduit fittings or battery filling tubes. The hydrogen vent fitting on the lid should be extended to the exterior of the building. Each of the boxes can be ordered with, or without a drain fitting. The drain allows the batteries to be washed and hosed off. The drain option includes a 3" rigid foam base with HDPE trim ring and 3/4" pipe that extends horizontally out of the trim ring. Dimensions listed are inside of the battery compartment. Shipping size is slightly larger.